◆ Identifying entire projects and the method of double validation guarantee a perfect match between the suppliers’ skills and the contractors and decision-maker’s requirements for their projects. ◆ The information exchange beforehand guarantees you meetings exclusively between motivated and identified professionals. 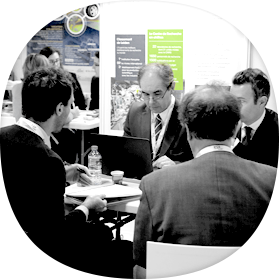 ◆ € 990 for a meeting schedule with highly targeted 17 meetings, premium networking opportunities. ◆ Light logistics and an event concentrated in time. ◆ Cancellation and reimbursement of your participation on request before the event if less than 5 validated meetings. Each participant has the possibility of asking you for a meeting; you can either accept or refuse. One week before the event you will receive your meeting schedule, including the meetings validated by both parties as well as the keynotes that you have requested to attend. PROXIMUM Group is the inventor of the double validation system for meeting choices and, in 1999, the creator of the first platform for organising meetings on-line.